Over the years, Greg and I have travelled the world to present at various conventions and to help set up different organisations in their field. Many people have asked us what it is like to visit other countries and what it is like to embrace other cultures, languages, and so on. In more than two decades we visited over 40 countries and met so many beautiful people which gave me the idea of sharing these precious moments abroad with you all. The first part of this travel story I will take you to South Africa where we worked together with a very special lady called Rose Harzenberg, the founder of the “ Worldwide Aquathlon Day”. “The Aquathlon Day” is a day that as many aquatic presenters conduct an Aquatic class/presentation for as many people as possible, and the money raised at this event is donated to a charity of their choice. The Aquathlon started small but has grown to become a Worldwide Aquathlon Event with 75 countries participating! Rose asked us to come to South Africa and help her to create and conduct the first ever Conference in Gonubie/East London, situated on the East Cape. And during the time we spent in South Africa, Rose and her husband Rob looked after us like we were royalty, nothing was too much trouble for them. When we arrived in Johannesburg we collected our hire care which would take us to Gonubie. 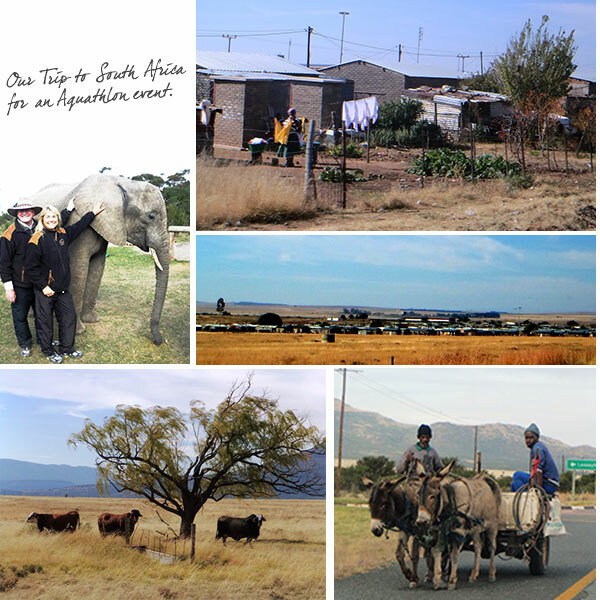 As it was our first time in South Africa we thought it would be best to travel by car to Bloemfontein and stay with a dear friend of Rose, Judilie Liebenberg and her beautiful family, and travel the last “leg” of the trip the day after. We didn’t realise that the trip ahead was over 1,000km, and the travel was somewhat different to the Aussie roads. The people from the hire car organisation warned us to keep driving and lock the doors of our car, "Only get petrol at service stations with a lot of people around," they told us. I looked at myself in the window and couldn’t help seeing a frown on my face, what were we in for? But there was no turning back and away we went. We went through parts of Johannesburg and the thought in my mind was that it was just another big town - let’s go and see the real South Africa! When we left “Joburg” the scenery changed, the roads became never-ending, and the traffic disappeared. Many hundreds of “coloured” people walked on the side of the road, they seemed to be going nowhere. There were no towns or townships to be seen so I wondered about their destination. All of a sudden I saw a semi-trailer with something on top of the roof. When the truck came closer I could see three dark people sitting on its rooftop, just clinging on to...whatever. Mind you, this truck was doing at least 100km per hour. It blew my mind - I certainly hadn’t seen anything like this before. After driving for an hour or two we went through little towns and did what we were told - we kept on driving. The most incredible characters walked the streets of the towns; we saw one dark South African man wearing all his possessions on his body in plastic bags. He must have been one metre wide because of the bags hanging off him. He stood on a street corner with his hand out for people to put some money in. Rose later told me these street people save the coins they are given and go to the shop to buy one cigarette! Day one took us to Bloemfontein without any worries. About 500km of road, little towns, and people walking on the side of the road. We arrived at the gate of Judilie’s house and she welcomed us like old friends. It's unbelievable that some people, like her and her husband, just welcomed us into their home because we were friends of Rose and Rob. Our hosts cooked us a meal and we met the entire family, the two beautiful daughters and a few dogs and cats. We had a great night and Judilie told us about South Africa and what to expect. Again she emphasised to be careful when driving. A lot of dark South African people have no job, no housing or poor housing, and not much to eat. If there is an animal on the road Judilie said, do not stop because if you do people come out of the bushes and rob you of everything you have. Dead animals would have been eaten a long time before they end up on the road, so be mindful of that. After looking at the high gates around the houses and the security cameras everywhere, I guess we got the idea about the situation. The next morning we were off early to start the last leg of our trip to Gonubie. Another 500km or so waiting for us before we were to reach our destination. After the day before we had an idea of what to expect, but we still fell from one amazing scene into another. We stopped to get petrol at a huge petrol station along the highway to find a South African McDonalds and we had some lunch. In the shop attached to McDonalds, we found Springbok Jerky and decided to buy some for our travels. It was fabulous, one of the best I have ever had. After about three hours we decided to have a break. A fantastic “carpark” with the local cows looking at us. The mountains surrounding the road and the carpark and not a person in site, just beautiful. The names of the towns and villages we came across made us laugh at times. All cultures coming together in names like Sterkstroom and Dordrecht (Dutch), Adelaide and Alice (Australian), Berlin (Germany) and, finally, Mdantsane where Rose took us a few days later, but I will come back to that special place. Coming closer to Gonubie the traffic got heavier and again we were amazed by the amount of people walking alongside the road. Hundreds of people walking to their next destination. Quite a few sat on the side of the road with their hand up and we thought they were after a lift, but we couldn’t be more wrong. All of them are after a job for the day and we were told that these people earn as much as perhaps two dollars a day. Life in South Africa is not easy for a lot of people we found out. People were very creative in doing the odd jobs here and there. At the coast, we saw a local car wash which was very different: the guys bullied the tourists into a carwash African-style. And if you decide to decline, they will scratch your car so many tourists just went with the less bad solution and said yes to the washing of the car. The guys would take a huge bucket to the ocean fill it up with water and “chuck it over the car”. A quick wipe after that and the job was done. It might surprise you all that Greg and I didn’t take our hire car to this spot much. Another job for many was “security guard services” at the local car parks. When you park your car some random guy would approach you and say," I will look after your car until you get back, ok?" They would do so for some coins when you return, but if you refused you might end up with a car that is not in the same conditions as before. What did I say, Creative? Yes to say the least! We passed the local bus stop with some ladies and children waiting with what looked like their entire household in buckets and sacks of all kind, and we looked at each other and smiled. The local delivery guys passed us on a cart with a horse in front and I quickly took a picture, I couldn’t help myself. Outside the East Cape, we passed the housing estates that looked somewhat different to our suburbs: corrugated iron and anything else available kept houses together. No brick houses so far, and we had to travel a bit further to see them. We agreed that we are very lucky to live in Australia with everything we have, and our houses we live in. We noticed one electricity pole that had about 80 live wires hanging off it! I guess a bit of creativity found its way there as well. The end of the trip was nearly there. Gonubie was in sight. Our destination was only around the corner, what more could we expect?